Many people have been using the Google Sync app to save their Office files straight to their Google Drive online storage, others still would like to see a more direct option. Google has now given us an plug-in app for Microsoft Office that I think many people will enjoy. Currently, this only works on the Windows version of Office – which means most of the computers in our school are in good shape! Start by downloading the plug-in app here. Scroll down to the big blue DOWNLOAD button if you don’t see it at first. Once your download has finished, open the file that you downloaded and click RUN. This will install the plug-in. Click on Allow at this sometimes scary looking warning. Now, you will have Google Drive show up in your “Open” dialog and your “Save” and “Save As” dialog. Becuase it’s a plug-in, it also adds a tab to your familiar Office Ribbon for all of your saving and opening needs. 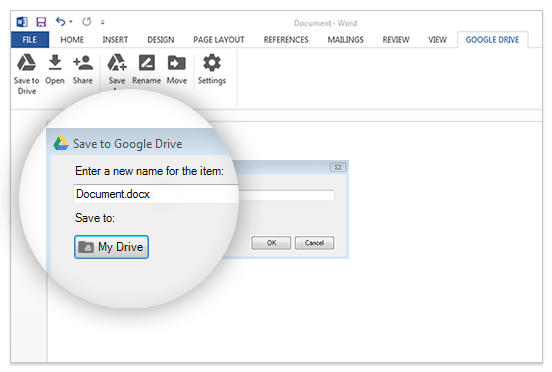 Either option – the FILE menu or the GOOGLE DRIVE tab from the Office Ribbon save your Office doc WITHOUT translating it to a Google Doc by default. This means the file can be shared around. However, Remember that Office files that are shared cannot be edited or commented on by other users. When using this method you are able to save your file to whatever folder you may already have on your Google Drive. The whole idea is that it works the way you’re used to working in Microsoft Office. Finally… did you know that we have Office 365 available for teachers with the brand-spanking-newest version of Office (for Windows, Mac, Android, and iOS). https://products.office.com/en-us/student and enter your @masonohioschools.com email and follow the prompts for free Office 365 subscription – complete with 5 free downloads. For more information, you can see Google’s official “Google for Work” blog post on this topic here. Next: Next post: Unleash your inner graphic designer. Better yet, let your students unleash theirs!